The Dalmatian coast is fast becoming the French Riviera of Eastern Europe and Hvar Town is its Cannes. The most obvious party spot is Carpe Diem at the end of Hvar Harbour. From a Bellini breakfasts to late night tipples, there is no time of day that this famous bar doesn’t offer a party atmosphere. In the late afternoon “Blue Hour” meets the post-beach crowd with smooth jazz music and live bands, as the sun starts to set the DJs kick in transforming the relaxed bar into a vibrant club. After midnight, you can take a short water taxi ride to its sister bar Carpe Diem Beach, set on the small island of Marinkovo. Hidden in the thick pine forests it is the ultimate private venue made up of a labyrinth of secret bars and intimate dance floors. For a cool and casual alternative, Hula Hula is a more bohemian refuge perched along the rocky coastline on the west side of Hvar Town. The bar is known for it’s apres beach parties and carefully created cocktails, it is also the best place in the town to watch the sun descend into the Adriatic. Where to berth: Hvar Harbour, one of the best anchorages in Croatia and where visitors such as 78 metre Venus, 70 metre Martha Ann and 50 metre Lumiere have dropped anchor in recent years, is right in the centre of Hvar Town, from here you can simply step from your superyacht and onto the marbled terrace of Carpe Diem. 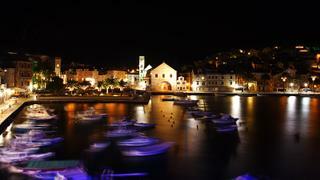 The Dalmatian coast is fast becoming the French Riviera of Eastern Europe and Hvar Town is its Cannes. 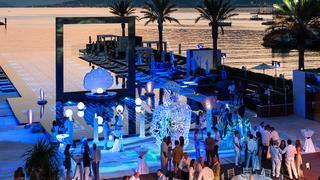 The most obvious party spot is Carpe Diem at the end of Hvar Harbour. From a Bellini breakfasts to late night tipples, there is no time of day that this famous bar doesn’t offer a party atmosphere. In the late afternoon “Blue Hour” meets the post-beach crowd with smooth jazz music and live bands, as the sun starts to set the DJs kick in transforming the relaxed bar into a vibrant club. After midnight, you can take a short water taxi ride to its sister bar Carpe Diem Beach, set on the small island of Marinkovo. Hidden in the thick pine forests it is the ultimate private venue made up of a labyrinth of secret bars and intimate dance floors. For a cool and casual alternative, Hula Hula is a more bohemian refuge perched along the rocky coastline on the west side of Hvar Town. The bar is known for it’s apres beach parties and carefully created cocktails, it is also the best place in the town to watch the sun descend into the Adriatic. Where to berth: Hvar Harbour, one of the best anchorages in Croatia and where visitors such as 78 metre Venus, 70 metre Martha Ann and 50 metre Lumiere have dropped anchor in recent years, is right in the centre of Hvar Town, from here you can simply step from your superyacht and onto the marbled terrace of Carpe Diem. A yachting hub on Turkey’s Turquoise Coast Göcek is fast gaining a reputation as one of the best party spots in the Mediterranean. A popular starting point for luxury yacht charters in Turkey and attracting some of the world’s largest yachts this pretty town comes alive during the summer months. Göcek’s party reputation was further boosted last year by the opening of the Q Lounge as part of D-Resort Göcek. Designed by the architects of Zuma this stunning treetop bar is the perfect place for a sundowner and also offers an exciting menu of contemporary Japanese cuisine. Open seven days a week until late during the summer Q lounge invites a selection of DJs transforming the relaxed vibe into full on party atmosphere later in the evenings. Where to berth: D-Marin Göcek can accommodate yachts up to 70 metres or anchor out and tender in to the pier just below the Q Lounge. A yachting hub on Turkey’s Turquoise Coast Göcek is fast gaining a reputation as one of the best party spots in the Mediterranean. A popular starting point for luxury yacht charters in Turkey and attracting some of the world’s largest yachts this pretty town comes alive during the summer months. 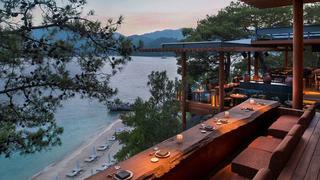 Göcek’s party reputation was further boosted last year by the opening of the Q Lounge as part of D-Resort Göcek. Designed by the architects of Zuma this stunning treetop bar is the perfect place for a sundowner and also offers an exciting menu of contemporary Japanese cuisine. Open seven days a week until late during the summer Q lounge invites a selection of DJs transforming the relaxed vibe into full on party atmosphere later in the evenings. Where to berth: D-Marin Göcek can accommodate yachts up to 70 metres or anchor out and tender in to the pier just below the Q Lounge. The Italian seaside resort of Porto Cervo in northern Sardinia, where Silvio Berlusconi owns a villa, is one of the best Mediterranean party spots during the summer season and is jam-packed with superyachts. 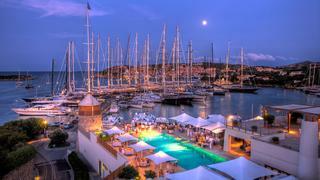 Yacht Club Costa Smeralda has been to go to hang-out of the European glitterati and jet-setters since the 1960s. After the sun sets on racing a vibrant social scene kicks off with sundowners, yacht hops, beach parties and formal dinners, all in the sublime setting of Porto Cervo. 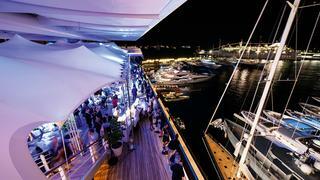 Where to berth: Porto Cervo Marina is the obvious place to enjoy the party scene. The Italian seaside resort of Porto Cervo in northern Sardinia, where Silvio Berlusconi owns a villa, is one of the best Mediterranean party spots during the summer season and is jam-packed with superyachts. Yacht Club Costa Smeralda has been to go to hang-out of the European glitterati and jet-setters since the 1960s. After the sun sets on racing a vibrant social scene kicks off with sundowners, yacht hops, beach parties and formal dinners, all in the sublime setting of Porto Cervo. Where to berth: Porto Cervo Marina is the obvious place to enjoy the party scene. Montenegro has rediscovered its glamorous reputation as a superyacht party hotspot and has even been dubbed ‘ the next Monaco for yacht charters’. Since opening in 2015, Platinum immediately stole the limelight as the top nightclub in the country. Located within Porto Montenegro, Platinum is open until late every night of the summer season and is host to a number of world renowned DJs. For a more relaxed evening, The Clubhouse, also within the Yacht Club, has a more laid back atmosphere with an electric drinks menu, live music and quirky themed nights. Where to berth: No place typifies Montenegro’s revival more than superyacht heaven Porto Montenegro, which offers everything a superyacht owner could want. Montenegro has rediscovered its glamorous reputation as a superyacht party hotspot and has even been dubbed ‘ the next Monaco for yacht charters’. Since opening in 2015, Platinum immediately stole the limelight as the top nightclub in the country. Located within Porto Montenegro, Platinum is open until late every night of the summer season and is host to a number of world renowned DJs. For a more relaxed evening, The Clubhouse, also within the Yacht Club, has a more laid back atmosphere with an electric drinks menu, live music and quirky themed nights. Where to berth: No place typifies Montenegro’s revival more than superyacht heaven Porto Montenegro, which offers everything a superyacht owner could want. No place is associated with the Mediterranean party season as much as this part of the French Riviera. From the celebrity yacht parties during the Cannes Film Festival to the adrenaline and fun of the Monaco Grand Prix, the area comes alive in May. However, throughout the summer season there are plenty of parties and nightclubs, such as Jimmy'z, packed with famous faces. Where to berth: When it comes to a glamorous party atmosphere few places can match Port Hercules. One of the best places to spot celebrities on superyachts, there are numerous companies available to help to organise the perfect party. No place is associated with the Mediterranean party season as much as this part of the French Riviera. From the celebrity yacht parties during the Cannes Film Festival to the adrenaline and fun of the Monaco Grand Prix, the area comes alive in May. However, throughout the summer season there are plenty of parties and nightclubs, such as Jimmy'z, packed with famous faces. Where to berth: When it comes to a glamorous party atmosphere few places can match Port Hercules. One of the best places to spot celebrities on superyachts, there are numerous companies available to help to organise the perfect party. Already a party hotspot, Puerto Banús in Spain was boosted in 2015 when superyacht owner and fashion designer Roberto Cavalli opened a new luxury club. 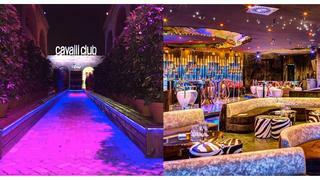 The Cavalli Club has a stunning exterior garden lounge and a great selection of Roberto Cavalli Vodka-based cocktails. Where to berth: Where else than at the marina of Puerto Banús itself, which can host superyachts up to 50 metres. Already a party hotspot, Puerto Banús in Spain was boosted in 2015 when superyacht owner and fashion designer Roberto Cavalli opened a new luxury club. The Cavalli Club has a stunning exterior garden lounge and a great selection of Roberto Cavalli Vodka-based cocktails. Where to berth: Where else than at the marina of Puerto Banús itself, which can host superyachts up to 50 metres. Arguably no destination is more synonymous with summer Mediterranean partying than Ibiza. Ushuaia Beach Club opened in 2011 and, with its poolside stage and chic atmosphere, has fast become an iconic Ibiza venue. If you don’t want to be in the middle of the action but still want to feel involved, then reserve a VIP box, which hangs over the crowds and offers fantastic views across the club and stage. Where to berth: Ushuaia Beach Club is on Playa d’en Bossa in the south of the island, so yachts can either anchor and tender guests in and out, or head around to the main port and a VIP service can bring guests to the club. *Nearby: *Less well known than some summer party spots, Formentera is Ibiza’s quieter but just as fun neighbour. The Gecko Beach Club, which sits on 150 metres of unspoiled yellow sand, is fast becoming the new place to be seen with Leonardo DiCaprio and Sienna Miller reportedly fans of its laid back atmosphere. Arguably no destination is more synonymous with summer Mediterranean partying than Ibiza. Ushuaia Beach Club opened in 2011 and, with its poolside stage and chic atmosphere, has fast become an iconic Ibiza venue. If you don’t want to be in the middle of the action but still want to feel involved, then reserve a VIP box, which hangs over the crowds and offers fantastic views across the club and stage. Where to berth: Ushuaia Beach Club is on Playa d’en Bossa in the south of the island, so yachts can either anchor and tender guests in and out, or head around to the main port and a VIP service can bring guests to the club. *Nearby: *Less well known than some summer party spots, Formentera is Ibiza’s quieter but just as fun neighbour. The Gecko Beach Club, which sits on 150 metres of unspoiled yellow sand, is fast becoming the new place to be seen with Leonardo DiCaprio and Sienna Miller reportedly fans of its laid back atmosphere. Tourist-heavy Mykonos might seem off-putting during high-season but if you know where to head there are still plenty of places to part in style. A 10 minute drive from Mykonos Marina is Nammos Beach Bar situated on Psarou Beach. A favourite hang-out for the wealthy Greek jet-set, it turns from lounge to nightclub in the evening. Where to berth: Ornos bay is situated in the South-West of the island is one of most popular in Mykonos because it’s sheltered from the Meltemi. The bay is also home to Kuzina, which is a great bar and restaurant by the beach with a fun ambiance. Tourist-heavy Mykonos might seem off-putting during high-season but if you know where to head there are still plenty of places to part in style. A 10 minute drive from Mykonos Marina is Nammos Beach Bar situated on Psarou Beach. A favourite hang-out for the wealthy Greek jet-set, it turns from lounge to nightclub in the evening. 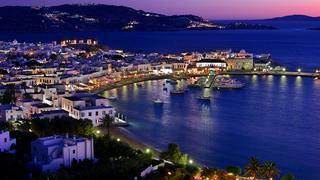 Where to berth: Ornos bay is situated in the South-West of the island is one of most popular in Mykonos because it’s sheltered from the Meltemi. The bay is also home to Kuzina, which is a great bar and restaurant by the beach with a fun ambiance.